April 30th is Dia del Niño in Mexico, so I took it as an opportunity to celebrate Mexican cuisine! Because who doesn’t love Mexican food? I used to love Children’s Day as a child! It falls on October 12th in Brazil and it was yet another opportunity to gather the family, as we did for any given holiday, and receive gifts from the adults. Toys, never clothes! You could get away with giving us clothes for our birthdays, but never for Children’s Day! One of the highlights of the holiday was eating my grandmother’s food, which is always a showstopper! She would make everything from scratch, appetizers to desserts, and the whole family would ooh and aah for everything that appeared at the table. You see, I consider myself to have had a lucky childhood, especially where food is concerned. My grandmother and my mom are great home cooks, and I like to think that it helped me develop my palate early on. However, I was (still am!) quite spoiled, which made their jobs somewhat hard. 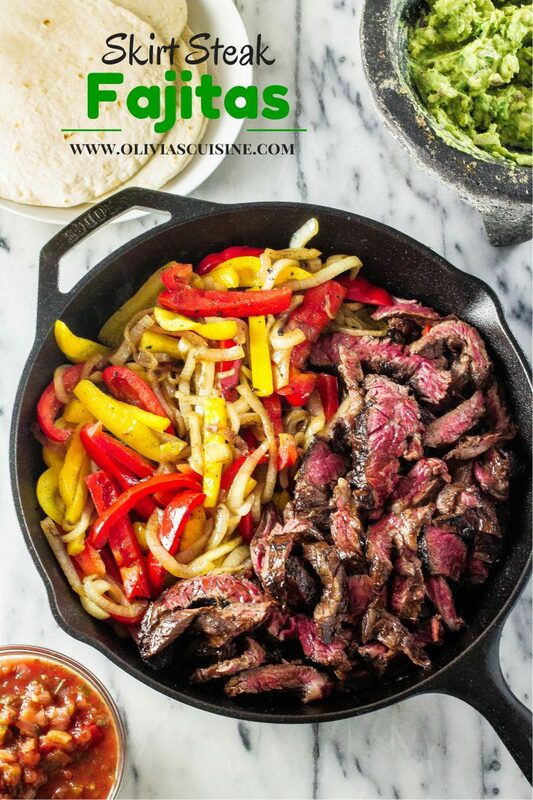 One thing I would have never eaten back then and I absolutely love now are Skirt Steak Fajitas! In the best case, I would have picked all the peppers from my plate and eaten only the steak… Nowadays, after I overcame a little of my ‘spoiledness’, I welcome how full of flavor this dish is, especially with the marinade I did using the Roasted Pasilla Chile cooking sauce from Herdez! Mexican food was something I only experienced later in life, around my 20’s, when Mexican restaurants started to become a thing in Brazil. The Mexican food frenzy started in the 2000’s and I remember going to a cool, hip Mexican restaurant next to my university. Where was all that delicious food my whole life? Guacamole, taquitos, enchiladas, burritos, tacos and, my favorite, sizzling fajitas that you can hear and smell as soon as they leave the kitchen. Now that I live in NYC, Mexican food is available all around. But there’s nothing like making it yourself and making sure that what goes in your family’s plate is fresh and high quality! To make cooking good Mexican food at home possible, Herdez has a variety of cooking sauces and salsas that will aid you in the making of any Mexican dish you can think of! Herdez has been the number 1 salsa brand in Mexico for years now. Their mission is to deliver fresh, traditional and authentic flavors to our tables. They believe in pride, tradition and celebrating great meals with simple yet flavorful ingredients which bring true Mexican flavors to your favorite recipes. If cooking Mexican food intimidates you, you should try using Herdez products. If you’re interested in learning other easy Mexican recipes, check out their website for over 100 authentic dishes. They all look and sound so delicious that I couldn’t possibly choose just one! If you wanna get specific, Fajitas are actually a Tex-Mex dish that first appeared in the 1930’s, in Rio Grande Valley, South Texas. However, they are served in Mexican restaurants all over the world, the Mexican variant of which is called Arrachera. The Fajitas have their roots in the cattle roundups, when beef were butchered regularly to feed the hands. The throwaway items (hide, head, entrails and meat trimmings, like skirt) were given to the vaqueros (Mexican cowboys) as part of their pay. Nowadays, you will find Fajitas made with shrimp, chicken, fish, pork, as well as other cuts of beef. 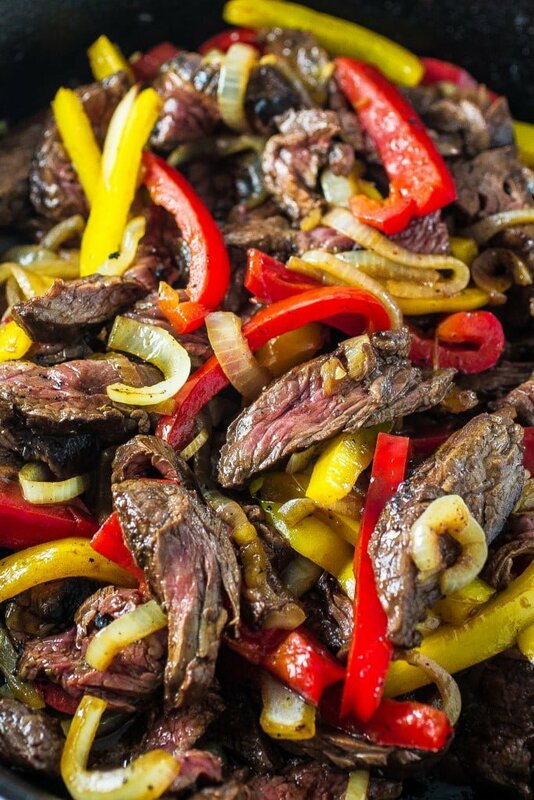 The only true fajitas, however, are made with skirt steak grilled with charcoal. As y’all know, I live in a tiny Manhattan apartment, so grilling is out of the picture until the FDNY decides to allow me to grill in my fire escape. So, as much as I would love to cook my skirt steak in a charcoal grill, I have to find an alternative that works indoors. And the answer is: a piping hot cast iron skillet! Feel free to use your grill if you can, but if you’re limited like me, I promise you will barely notice the difference. Also, please make sure you don’t overcook the steak. Skirt steak is supposed to be cooked just enough to be pink on the inside. If you overcook it, it will be rubbery! You want them to be buttery, juicy and full of flavor and not a piece of rubber that you will have to struggle to chew. If you’re into well done meat, use sirloin as that cut can take more heat than skirt. And that leads to another important step: carving. You will increase your steak’s tenderness if you slice it thinly AGAINST the grain. I promise you, it makes all the difference in the world! 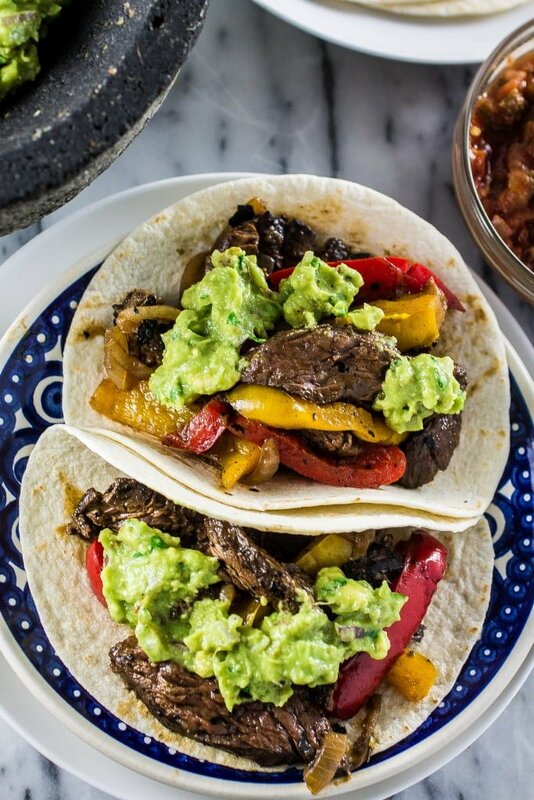 The secret for the most flavorful fajitas? The marinade I made with Herdez Roasted Pasilla Chile, blackberry preserves, tequila, balsamic vinegar, oil and rosemary. I marinated my steak overnight, but you can do it for up to 24 hours as the flavors will only increase. Now all you need are some warmed tortillas, guacamole, salsa and some sour cream! Sometimes I also like to eat my Fajitas with rice and beans. In a medium bowl, combine the HERDEZ® Roasted Pasilla Chile cooking sauce, the blackberry preserves, the tequila, the balsamic vinegar, the vegetable oil, the rosemary and the salt and pepper. Whisk everything together until smooth. Add the skirt steaks to the marinade and toss to coat. Transfer the steaks with the marinade to a re-selable plastic bag and seal. Refrigerate for 8 to 24 hours to tenderize and develop the flavors. You don't need to oil the cast iron, as the steaks are coated in the marinade, which has oil. Grill the steaks over medium-high heat, cooking for 4 to 5 minutes on each side or until a thermometer reads 130°F. You might have to do this in batches, depending on the size of your cast iron skillet. Transfer the cooked steaks to a cutting board to rest. While the steaks are resting, add some olive oil to the skillet if needed and cook the onion and peppers, stirring occasionally, until softened (8 to 10 minutes). Season with salt and pepper. Take skillet off the heat. Thinly slice the steak diagonally, against the grain, and transfer them back (with juices) to the cast iron skillet. Serve hot with some warmed tortillas, guacamole, salsa and other toppings of your choice! As Dia del Niño celebrates the kid in everyone, HERDEZ brand is holding a #ThrowbackThursday photo contest on its Facebook wall! This promotion will last from April 6th to – April 30th. Each week, three winners will be chosen to win a Día del Niño prize pack. One grand prize winner each week will win a socialmatic camera, film, HERDEZ product, HERDEZ apron and recipe cards. Two runner up winners each week will win a selfie stick, HERDEZ product, HERDEZ apron and recipe cards. To enter, submit your favorite childhood photo tagged with #ThrowbackThursday directly on HERDEZ’s Facebook page. YUM!! Can you send me a plate of these right now!! These will be on the menu for next week!! Mexican cuisine always make me happy :) So bold and delicious flavors! Olivia, I loved the use of tequilla! Wow, that meat looks SO good. I am officially drooling here. Looks yummy! You are making me crave steak fajitas. I’ll have to make these soon! Thank you, Linda! Steak fajitas are always a hit! I basically NEED these for Taco Tuesday tomorrow! I’m a fajita fiend! Thanks, Jenn! They would be great in tacos!!! This looks perfectly scrumptious and so easy Olivia! Yes please!! This looks great! I love fajitas! The guacamole makes the perfect addition to them. You’re right, who doesn’t love Mexican food?